Music subscription service Spotify got a more refined collaborative social listening experience this weekend, thanks to a relaunch of the Soundrop app within the Spotify client. Soundrop, which allows Spotify users to join “rooms” to listen to playlists together. The update adds an advanced Facebook integration and private rooms to Soundrop, amongst other things. Soundrop has been one of the more popular apps on Spotify: The Soundrop team told us in January that it was able to gather 265,590 unique visitors within 20 days shortly after launching on Spotify, and the music service revealed last month that Soundrop users streamed a total of 15 million tracks in February. The new features should help to get Soundrop even more action: Users that log in with Facebook can now see which rooms their friends are in, and invite their friends to join them in private rooms that are not discoverable by others. Rooms can be personalized with artwork and a unique description, and Soundrop is adding search capability to make it easier to find a room. Users have to relaunch their Spotify client to access the new features. And there is more to come: Soundrop CEO Inge Andre Sandvik told me via email that the company will add localization soon. With the update, users are able to specify their location when launching their own room. Soundrop will use this data to show users rooms nearby in the near future. 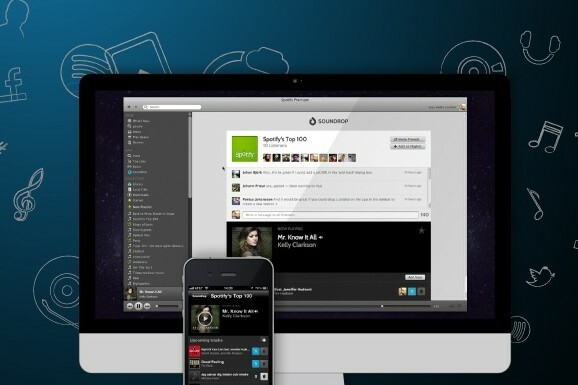 Soundrop is one of those apps that bring a more radio-like, curated listening experience to Spotify. That helps the music service with a big downside of music subscription services: Catalogs with millions of songs require active choice — but more often that not, music fans just want to tune in and have songs selected for them.